Stephen Crane’s words are quite appropriate for an experience my son and I had recently off the coast of Ponce Inlet, Fla. I was in the Sunshine State on a working vacation and my son Dane, 16, (pictured above) accompanied me. Dane and I like to fish together. 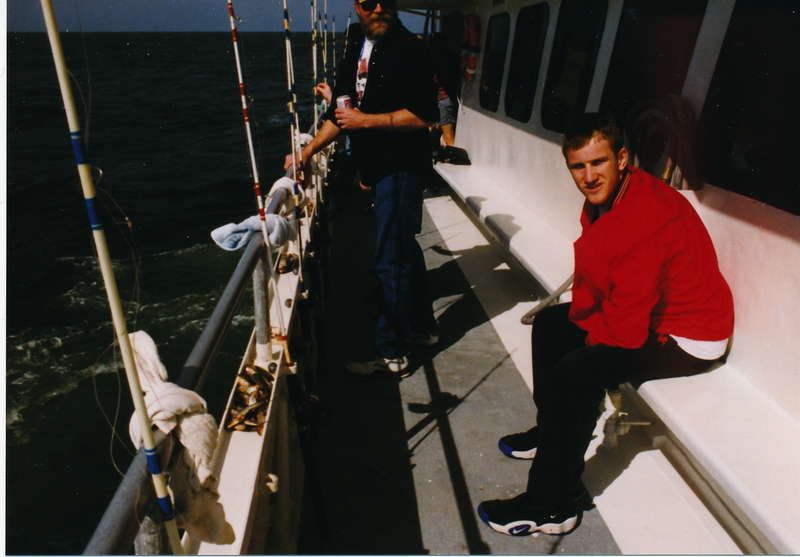 So, to add a little adventure to this trip, I decided we’d go on a deep-sea fishing trip aboard a charter boat. Both four-hour and eight-hour sessions are offered. I made reservations for a four-hour excursion aboard the Sea Love on our last available afternoon. Unfortunately, the day dawned cloudy and windy with thunderstorms in the forecast. I’m sure “eight-foot swells” meant something to her but they meant nothing to me. I’m very determined (my wife says the word stubborn is more appropriate). And, as we drove away, I remembered another nearby charter operation, the Critter Fleet. I decided to see if they still had plans to sail that afternoon. “I don’t suppose you’re going out today,” I said to the clerk. My persistence had paid off! “We’re using the biggest boat, the Super Critter,” the woman said as she imprinted my MasterCard. I thought about buying Dane a souvenir T-shirt at that time as a remembrance of this father/son adventure, but I decided to wait until after we got back – it would mean more then. “Be ready to board at five before one,” the woman behind the counter said. I checked my watch. It was 12:15 p.m.
On retrospect, signing up to take a four-hour fishing cruise despite “eight-foot swells” was a mistake. But going back to the car and eating submarine sandwiches and drinking pop while waiting for the appointed hour of departure also was not the brightest thing Dane and I have ever done. At five before one, my son and I were standing on the dock with nearly 20 others, anxious to board Super Critter. Most of the other people were men, but there were two or three couples and at least one family – mom, dad and two sons. 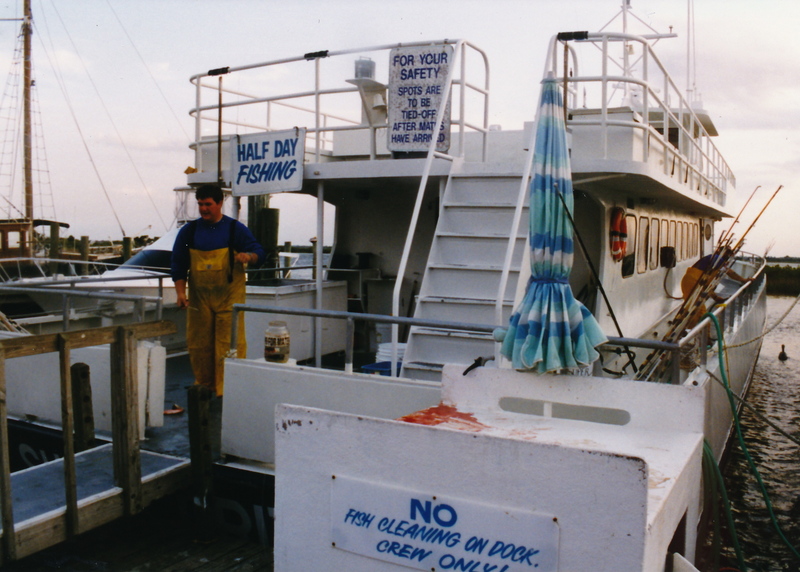 “I’m not going to sugarcoat this,” the first mate told us before we were allowed on board. “It’s choppy out there today. If you think it’s bad on the lower deck, it’s twice as bad on the upper deck. “If you get sick, don’t throw up in the bathroom. Don’t throw up in the trash cans. And don’t throw up over the railing of the upper deck – you’ll hit someone below you. Throw up over the railing of the lower deck – you’ve got the entire Atlantic Ocean. “You won’t need to know this,” he continued. Then he proceeded to tell us where the life jackets were kept, and he demonstrated how to use them. The waters were calm and the ride was peaceful. That is, for five minutes, until we left the inlet. As we headed 12 grueling miles out to sea, Super Critter was met with resistance and loped over each wave. It also took some side hits that made it sway from side to side. Super Critter’s diesel engine roared and revved that afternoon, allowing the boat to do battle against the monster ocean. Even as we sat in the dayroom, I could smell the engine’s exhaust, and it heightened the queasiness building in my stomach. I looked at Dane. He was expressionless and pale. We were two seasick sailors. Some of the fishermen used the time we spent traveling to our fishing spot playing cards, laughing and drinking beer. I envied them. One couple sat in front of us and played Euchre with two young men. But only five minutes into the game, the young woman hurried outside to the railing – and it wasn’t to watch for sharks. After she emptied her insides, she spent the rest of the afternoon lying on a bench in the dayroom. Not yet to our destination, my sickness was building. I thrust a spearmint-flavored cough drop into my mouth in an attempt to take my mind off my churning stomach and a headache. I normally have a cast iron stomach, and motion seldom makes me ill. The only carnival ride that has gotten to me has been the Galleon, that big “boat” that swings like a pendulum. As we reached our destination, I was feeling like I was on the Galleon. And I remember thinking to myself: If this were a carnival ride, it’d be over in two minutes. But this experience – and the illness – will continue about three and a half hours more. The boat still heaved to and fro even after its anchors were dropped 50 feet to the ocean bottom. But it was time to fish, so we moved outside to the railing with the others. Waiting for us there were poles and bait – cut up pieces of squid and dead sardines, both fairly aromatic. 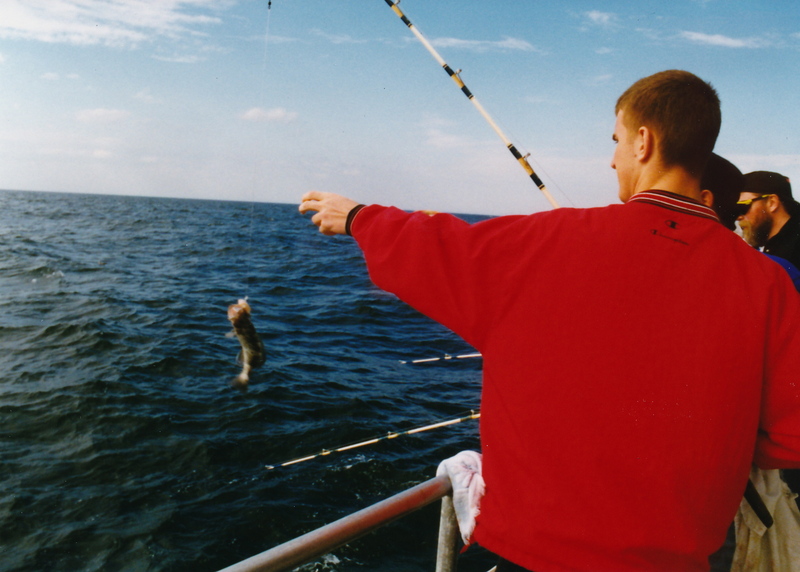 Handling the fishing rod while deep-sea fishing often takes two hands. With both hands on the rod, we were unable to hold onto the railing, so we’d lean against it to avoid being jostled about by the rocking boat. I didn’t fish very diligently, and I didn’t catch anything. Dane caught a couple of small fish. I snapped his photo, but he’s pale and there’s no smile on his face. “I paid sixty bucks just so you and I could be sick,” I said to Dane. Although Dane and I never lost our submarine sandwiches overboard that day, our stomachs didn’t return to normal for 24 hours. 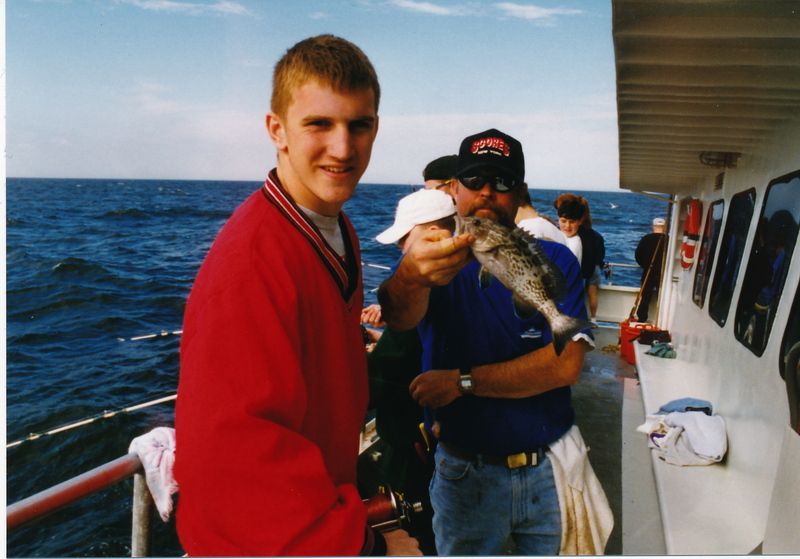 Even now, whenever I get a whiff of diesel fumes or put a spearmint cough drop in my mouth, I have flashbacks of that day of fishing hell. I never did buy Dane that souvenir T-shirt, either. It would have just served as another reminder of something we’re trying to forget. 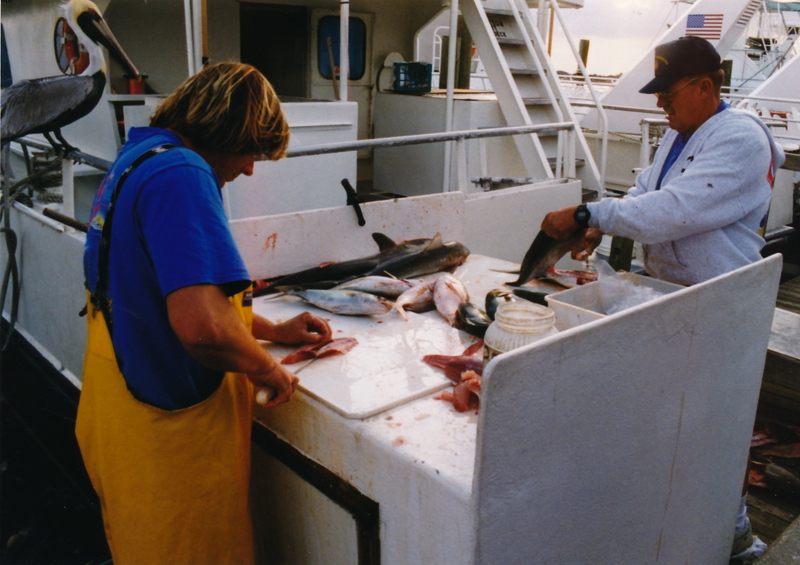 Only one aspect of that fishing expedition makes me smile: We signed up for four hours instead of opting for an eight-hour cruise! Copyright Feb. 25, 1998. This “Everyday People” column appeared in The North Scott Press, Eldridge, Iowa. Long before the December 1975 phone conversation that led to Janet’s biggest adventure — a shot at Big League racing — she had experienced a lifetime of adventures. Janet was adventurous by nature. Maybe she inherited that from her father, who was raised on an Iowa farm. Janet’s love for adventure surfaced early. She learned to ride the bicycle she received for her fourth birthday in just two hours — with only a push to get her going and without training wheels. When the Guthries moved to a primitive house deep in the woods of Dade County, instead of worrying about the prowling panthers and slithering snakes that lurked nearby, Janet shinnied up pine trees to listen to the ocean breeze. She also looked forward to weekly trips to the library, where she checked out adventure books. Never mind that most of the heroes she read about were boys. Janet’s parents enrolled her in a private school, Miss Harris’ Florida School for Girls. She started in the second grade and attended the next 11 years, mostly on a confidential scholarship. While some girls Janet’s age longed to become cheerleaders, “I longed to go play in the clouds. From books, I knew what that would be like,” she says. In 1953, Lain Guthrie gave in to her begging and taught his 15-year-old daughter how to fly a Piper Cub. She soloed a year later. Janet made her first parachute jump at age 16 after nagging her father until he gave in. She had practiced her landings by jumping off the roof of the family’s house. At 17, Janet earned her private pilot’s license at a grass airstrip where she worked to pay for flying time. That fall she entered the University of Michigan’s College of Engineering. She didn’t go straight through college, however. Adventure called. Janet took a year off at the end of her sophomore year to earn a commercial pilot’s license and a flight instructor’s rating. She then spent a couple of months hitchhiking around Europe before returning to school and graduating with a physics major in 1960. Janet’s next adventure took her to Long Island, where she hired on as a research and development engineer for an aerospace firm. There was only one problem: She wasn’t flying, and she missed it. Janet considered buying a half share in an airplane. Instead, she saw a classified ad for a car whose style she loved, a Jaguar XK 120 M coupe. A gray 1953 was for sale for $1,200 in Manhattan. Now, thanks to a modest lifestyle and loans from both a bank and a finance company, Janet would buy the Jag. Her adventurous spirit had taken her from airplanes to sports cars. Janet and her Jag competed at gymkhanas and hill climbs before she attended a driving school and dove headlong into sports car racing. In November of 1964, another opportunity for adventure briefly presented itself. NASA was looking for candidates for its Scientist-Astronaut Program. Janet applied, and her test results advanced her to the second round of evaluations. But she and the other women applicants were rejected the following year. Janet’s sports car racing adventure continued, and she became a full-time racer in 1972. There were successes, but “at the end of ’75, I was completely out of money. I had no house, no jewelry, no insurance, no husband, no savings. I was in debt, and I had one used-up race car,” Janet recalls. Janet Guthrie’s biggest adventure ever was about to begin. Copyright March 17, 2006. 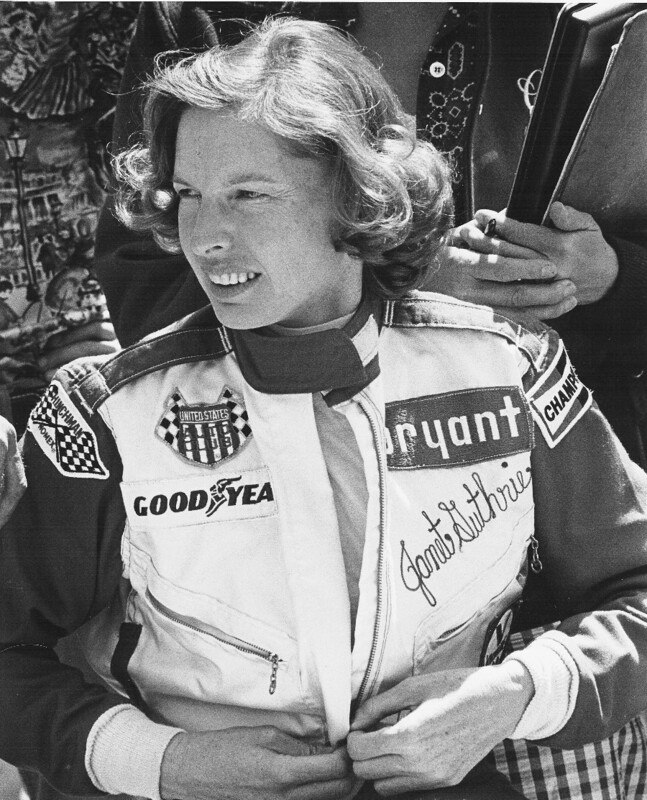 In 2006, Janet Guthrie was inducted into the International Motorsports Hall of Fame. I am honored that she selected me to write this profile about her for the induction ceremony program. When the world first heard of Janet Guthrie, she was already an experienced racer with a desperate need to advance. Guthrie’s big break — an invitation to make a qualification attempt for the 1976 Indianapolis 500 — came in late 1975, after she’d already competed in 120 sports car races over 13 years. The quiet young lady with a wide smile, a former aerospace engineer with a degree in physics, was a good driver; she had won her class twice in the 12 Hours of Sebring. But she was also dead broke. Then the phone rang. It was Indy team owner Rolla Vollstedt, whom Guthrie had never heard of. He asked her if she’d like to take a shot at the Indianapolis 500. “All that followed was due to Rolla Vollstedt,” Guthrie says. 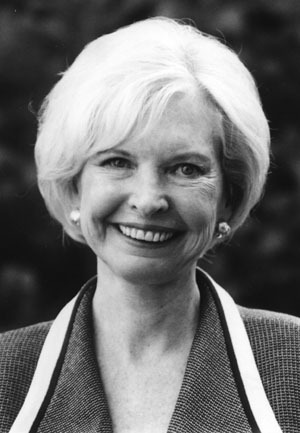 In fact, her fabulous autobiography, “Janet Guthrie: A Life at Full Throttle” (Sport Classic Books, 2005), is dedicated to him, among others. Guthrie drove in her first Indycar race at Trenton in early May 1976. Then it was on to Indianapolis, where most of the drivers and crews, and some spectators, chose not to welcome with open arms this single, five foot-nine inch, 135-pound female driver. Vollstedt’s car had not made the field at Indy in 1975, even with experienced open-wheel driver Tom Bigelow behind the wheel. Guthrie also could not make it go fast enough to qualify in 1976. But another opportunity had presented itself. Guthrie had received an offer to try to qualify for the Coca-Cola 600 NASCAR race. But she did make it, qualifying right behind Dale Earnhardt and Bill Elliott. Then some folks said Guthrie would be worn out after 40 laps in a stock car with no power steering, and she’d have to pull in. They were wrong. They didn’t know this soft-spoken, modest woman who liked classical music and ballet was also very, very determined. “I finished 15th,” Guthrie says. She had become the first woman to qualify for and compete in a modern day NASCAR race. Guthrie drove in some more NASCAR and Indycar races in 1976. The next year she became the first woman to qualify for and race in the Daytona 500. In May 1977, Guthrie and her crew overcame one frustrating problem after another to put a prototype car in the field at Indianapolis, making her the first woman driver to qualify and race there. In all, Guthrie competed in three Indianapolis 500s — her best finish was ninth in 1978 — and in 33 NASCAR races between 1976 and 1980. Guthrie’s top NASCAR finish was sixth at Bristol in 1977. Her life and racing career are both well detailed in her book.”This book puts you inside a driver’s mind and in the driver’s seat and explains the excitement a lot of people have found in Nextel Cup and, to a lesser extent these days, Indy cars,” she says. It also teaches us something about perseverance and determination. Copyright 2006. This article appeared in Stock Car Racing magazine. Forget the good ol’ days: These are pleasant potties! Remember the days — long before the interstate highways — of traveling to grandma’s house on two-lane ribbons of asphalt? The route wasn’t very direct, you slowed to a crawl every time you came to a small town or drove through a large city and, when nature called, some of the restrooms you were forced to use at gas stations along the way were often less than pleasant places to spend time. They sometimes were at gas stations where you had to track down a door key or wait your turn to get in, which wasn’t much fun when you had consumed one too many bottles of Dr. Pepper along the way. Remember the condition of many of those restrooms? They were often small and dingy. Sometimes the ceiling light was burned out, and you felt your way around using the little daylight that slipped through a tiny, frosted glass window. The toilets and urinals were often filthy. In worst cases there was no hot water or soap, and the cold water faucet had leaked for so long there was a rust mark below the drip, drip, dripping stream of water on the porcelain sink. The white or pastel blue cotton towel-on-a-roll was wet to the touch; that’s because the roll had long ago come to its end and everyone with wet hands was using the same square foot of material to try and dry them. The wastebasket, if there was one, was overflowing and scraps of toilet paper littered a dirty, sticky floor. Yuck! There are still some potty pits out there being passed off as restrooms. But there are some tantalizing toilets, too, that you can use without first checking to see if your vaccinations are up to date. Some of the more charming commodes can be found right here in Scott County! That’s right, among the top toilets for travelers are those at Iowa 80 Truckstop at the Walcott interchange along Interstate 80. Restrooms at what is billed as the world’s largest truck stop even made the top 10 finalists in the “America’s Best Restroom” contest presented by Cincinnati-based Cintas Corp., a provider of restroom hygiene products and services and company uniforms. Tens of thousands of people voted online prior to a July 31 deadline to determine a top five from among the 10 finalists. Pleasant potties do, after all, make a difference to folks. The 2008 contest attracted nominations from a wide cross-section of businesses, including restaurants, hotels and casinos. The top five in the voting were selected based on exceptional hygiene, style and open access to the public. 1. The Hermitage Hotel, Nashville. Tenn.
2. 21C Museum, Louisville, Ky.
4. The Signature Room at the 95th, Chicago, Ill.
5. Smith College Museum of Art, Northampton, Mass. The remaining finalists, those placing sixth through 10th in the balloting, were El Monte Sagrado Living Resort and Spa in Taos, N.M.; Grand Central Terminal in New York, N.Y.; Jerome Bettis’ grille 36 in Pittsburgh, Pa.; The Montville Inn in Montville, N.J.; and the Iowa 80 Truckstop in Walcott. This was the first year a truck stop made the top-10 list. And try they do. Five thousand customers visit the huge, 200-acre complex each day. Many of those people use the Iowa 80 restrooms while there. It takes a 25-member housekeeping team to keep the restrooms and the showers for professional drivers in showcase condition. “One of our claims to fame as well (as our restrooms) is our showers that we have for drivers,” DeBaillie says. “They are exceptionally clean, and we’re constantly getting positive comments about that. Iowa 80 does, indeed, have some fancy flushers. 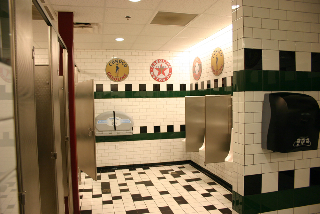 The men’s restrooms at the truck stop that never sleeps are themed to reflect service stations of the past, with custom tile and nostalgic gasoline and oil signs. The women’s restrooms are decorated in pink and display signs offering humorous advice and trivia on a variety of topics, like dieting and shopping. You leave Iowa 80 restrooms feeling good, not grimy. Copyright Oct. 2, 2008. This article has been submitted to The North Scott Press, Eldridge, Iowa. Grant Price at his desk at the Iowa Broadcasting Archives. Photo courtesy of ibna.org. located at Wartburg College in Waverly, Iowa. One of the most distinctive and influential voices in Iowa broadcasting history is now silent. Grant Price, hall of fame broadcaster and professor emeritus of Communication Arts at Wartburg College, died peacefully with family present on Friday, Oct. 17, after a short illness. He was 85. Services will be held Wednesday, Oct. 22 at 11 a.m. at the First Presbyterian Church in Waterloo. Visitation will be Tuesday, Oct. 21 from 4 to 7 p.m. at the Locke Funeral Home in Waterloo. Price began his radio career in 1941 on KSCJ in Sioux City. After service in World War II, he returned to Sioux City, becoming the one-man news department at KTRI radio. In 1948, he moved to the powerhouse signal of KXEL-AM in Waterloo, where he succeeded H.R. Gross as news director. A decade later, as television was capturing the attention of America, Price became news editor for WMT-AM/TV in Cedar Rapids in 1959, and director of news services for the stations in 1961. During his time at WMT-TV, the station was the dominant news source in eastern Iowa, with rating totals greater than the station’s two competitors combined. After WMT was sold to out of state owners, Price left Channel 2 and returned to Waterloo, serving as vice president for news and public affairs for the Black Hawk Broadcasting Company and overseeing the news operations for the company’s flagship station, KWWL-TV. When Grant Price left WMT, it was a dominant #1 in the ratings; within two years of his arrival at KWWL, Channel 7 became the market’s top-rated newscast, a position the station would hold for more than 30 consecutive years. During his time at KWWL, Price was well known for hosting the weekly public affairs series “Focal Point: The Community” and for delivering regular on-air editorials, called “Viewpoint”. While he retired from the newsroom in 1989, he continued to deliver “Viewpoint” editorials until 1993. He also hosted the unique quarterly “Broadcasting and You” programs, where station officials answered questions from KWWL viewers. At a time when most would have been satisfied after nearly a half century in the field, Grant Price found a new challenge: becoming a college professor. Following in the footsteps of fellow broadcasting legend Jack Shelley, Price became an educator, assuming the title of R.J. McElroy Chair & Executive-in-Residence at Wartburg College. 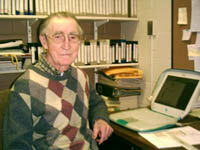 He founded the television broadcasting program at Wartburg, and taught classes there each semester until 2005. In 1994, Price determined that much of the history of radio and television in Iowa was being lost. Feeling that this history was worth saving, he started the Iowa Broadcasting Oral History Project. To date, more than 125 interviews have been conducted with many of the men and women who built electronic media in Iowa. In fact, Price conducted three interviews for the collection this past summer alone. The Iowa Broadcasting Oral History Project led to creation of the Archives of Iowa Broadcasting, designated as the state’s primary repository for materials relating to radio and television in Iowa. Article from the Wartburg Magazine when Grant retired from teaching in 2005. Click here to watch a clip from the 1964 WMT-TV documentary “Funnel in the Night,” hosted by Grant Price and produced by national TV legend Dennis Swanson. Click here to watch a clip from a 1974 news conference where Grant Price asked President Richard Nixon a question; the answer made front page news around the country. Grant Price delivered his final newscast on KXEL radio in Waterloo on Feb. 21, 1959. Click here to listen to an edited portion of the first part of his midday 15-minute newscast; click here to listen to his ‘farewell’ to KXEL listeners. More audio and video clips will be posted soon, as we celebrate the life–and mourn the passing–of Grant Price. I had the privilege of a final conversation with Grant when I visited him in the hospital just last Tuesday, only three days before he died. He expressed to me tremendous gratitude for all the wonderful friends and colleagues he had who were thinking of him. We talked about many things, including the Archives and how our various projects were progressing. The past 10 years I have spent working virtually daily with Grant on the Archives and other projects have been personally and professionally fulfilling. I can’t imagine what it will be like to go over there tomorrow, knowing that he’ll never return to his desk in the archivist’s office. But one thing is certain: we will redouble our efforts to continue making this collection a resource that Iowa can be proud of. It’s the least we can do, to repay Grant for all he did for so many of us. It’s been a couple years now, I guess, since Greg Schnoor did some Olympic-caliber tumbling in my kitchen. But unlike most gymnasts, he didn’t use a balance beam. Greg used a chair at my kitchen table. It was something to behold. Greg was starting a business, and I own a small home-based advertising agency. He stopped that morning so we could talk about advertising. The kitchen is the hub of activity at our house, so we went there, and I offered him a chair. Greg dropped back into the chair. Then, almost as if it were happening in slow motion, he and the chair kept drop, drop, dropping — all the way to the floor. For a moment, Greg and I looked at one another, both frozen in shock, our mouths hanging open and our eyes as wide as saucers. Me standing over him and Greg sitting on the kitchen floor among the pieces of wood that had once been a chair. “Are you OK?” I asked, wondering why that doggone chair couldn’t have attacked its owner instead of a visitor. Greg, with a sheepish smile on his face by this time, answered something like, “I’m better than the chair,” which had a broken back leg. I helped Greg to his feet and he took another chair, settling into it quite gingerly this time. I think we both were holding our breaths. Happy birthday, Greg. And next time you visit, please bring some wood glue, will you? Copyright Oct. 8, 2008. A story written for reading at my friend Greg Schnoor’s surprise Oct. 11 55th birthday party.